In a bowl, toss everything together. In a shallow dish or baking sheet, spread the coated chickpeas out and space evenly. Roast for an hour to insure a proper roasting. Taste one or two, if they are at all soft, they are not done. You can lower the heat if longer roasting is neccesary. When they are done, using a slotted spoon, lay them out on a cooling plate or onto paper towels. While hot and the oil is present on the surface, SPRINKLE MORE SALT, the oil will help it stick. SUPER FRICKEN DELICIOUS. They will get crunchier as they cool so it is just as important to not overcook as it is to not undercook. This entry was posted in mains and tagged animal free, dairy free, fricken yum, quick protein, salt, simple food, slow fast food, THE VEGAN LOVE PROJECT, VEGAN LOVE, vegan protein, vegan snack, vegan snacks to go, yoga fuel. Bookmark the permalink. Can’t wait to try these! 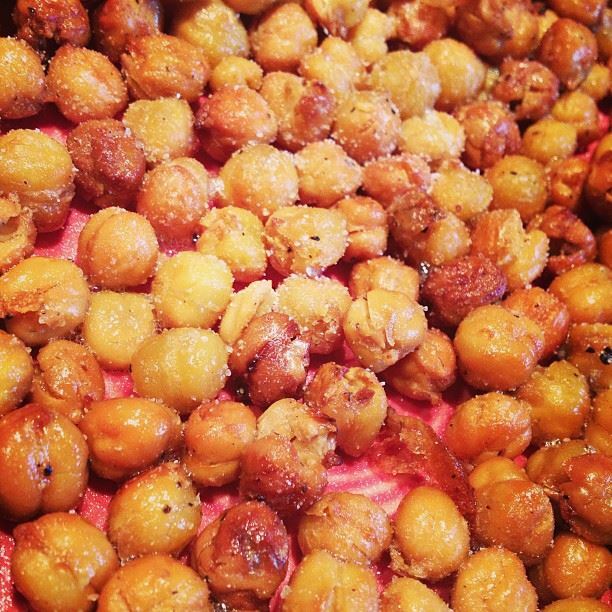 I snack on chickpeas just as they are…these sound delicious! THEY ARE SOOOOO GOOD! let me know how they come out! IN DA OVEN…… These are such a great, high protein salty yummy snack….